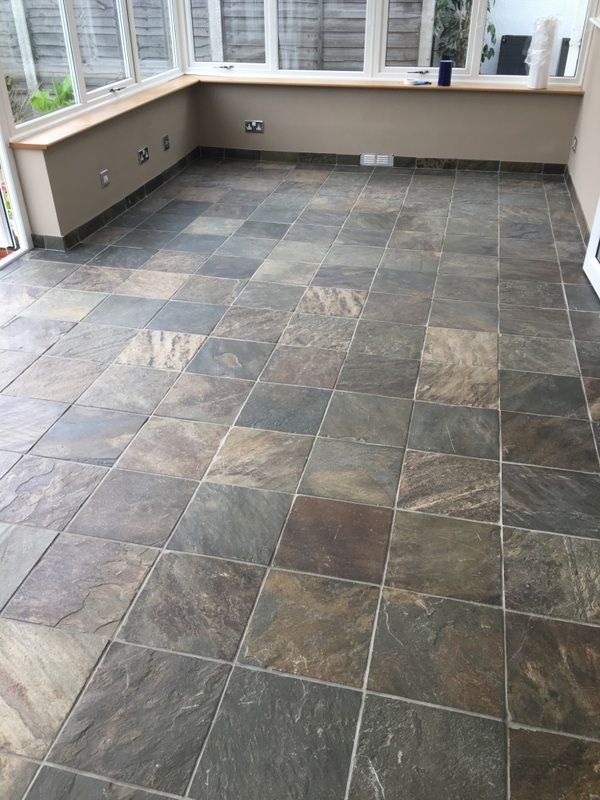 This Slate tiled floor had been installed in the conservatory of a property in Eastbourne, which I’m sure your aware is a large and well-known seaside resort town on the south coast of England. The home owner contacted Tile Doctor to see if a deep clean and a fresh seal could turn this floor’s fortunes around. 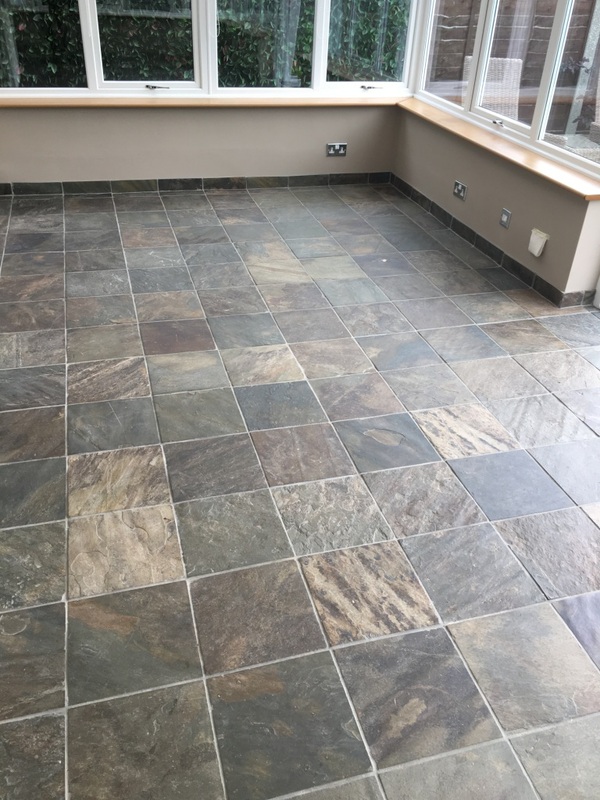 The combination of durability and price makes Slate a popular choice for floor covering, it’s also available in a number of colours, ranging from plain black to a more diverse array of shades. 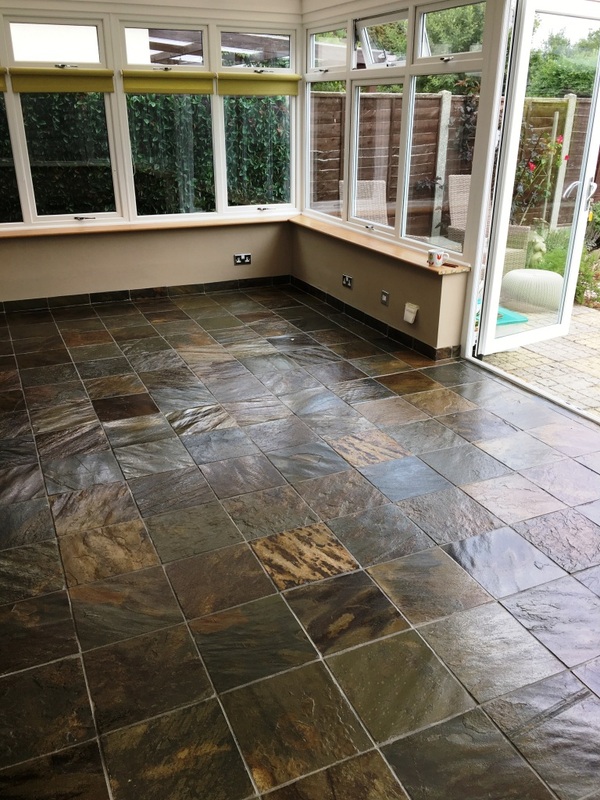 The Slate tiles pictured below are a good example of the latter. Unfortunately, they were looking very tired and had many obvious scratches which were further spoiling their appearance. In other words, they were desperately in need of restoration! The word Slate actually comes from the Old French word Esclate, which means ‘piece broken off’, or ‘to split and break’. Which makes sense as Slate tiles are actually made by splitting a larger piece along the grain. To deep clean this floor, we used a combination of two Tile Doctor products. First was Pro-Clean, an alkaline-based cleaner which we use in the majority of natural stone cleaning jobs we undertake as it very reliably removes heavy soil build-up. The second product was Tile Doctor NanoTech HBU, a very strong product which utilises nano-sized cleaning particles to penetrate into the pores of the stone, getting underneath and dissolving any stubborn muck. The combined solution was applied to the floor and then covered in a thin plastic sheet so that it wouldn’t dry out and left to sweat for an hour. The cleaning solution of Pro Clean and NanoTech HBU was then worked into the entire floor using a scrubbing pad fitted to a heavy rotary machine. The floor was rinsed with water and the resultant slurry removed with a wet vacuum. The revealed floor was much cleaner and fresher, and I was able to spot treat stubborn areas before giving it a final rinse. The slate floor was then left to dry completely overnight so that it would be ready for sealing the following day. To seal the tiles, we once again opted to use two different products. Firstly, we applied Tile Doctor Stone Oil, which is an impregnating sealer that adds colour making any imperfections blend back into the tile, which was useful as there were quite a few scratches on this floor. 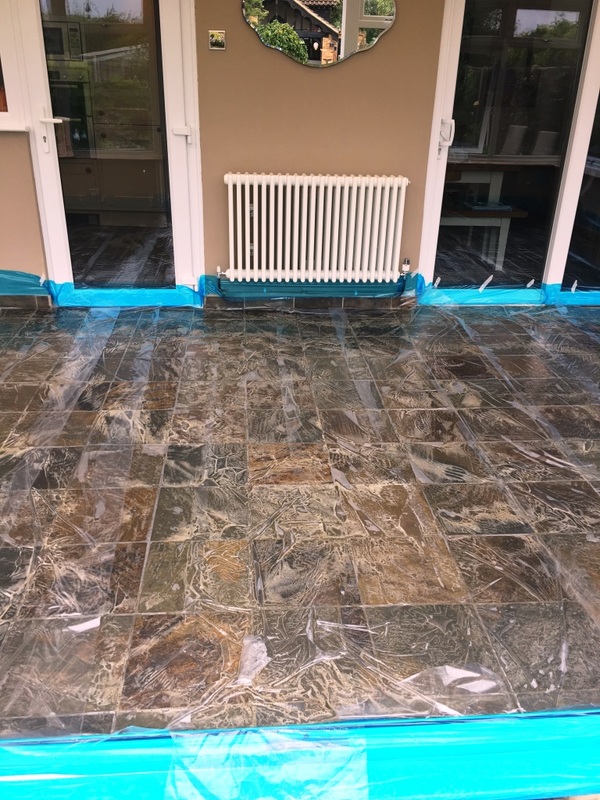 Secondly, we applied four coats of Tile Doctor Seal and Go, which is a topical sealer formulated to provide long-lasting protection against ingrained dirt. It also leaves a high-quality sheen finish which really enhances the overall character of the floor. The results of the restoration can be seen in the photos above. We were very pleased with the outcome and the customer was equally very happy. As you can see the patina of the Slate tiles is much more impressive – and it lends more personality to the entire room. 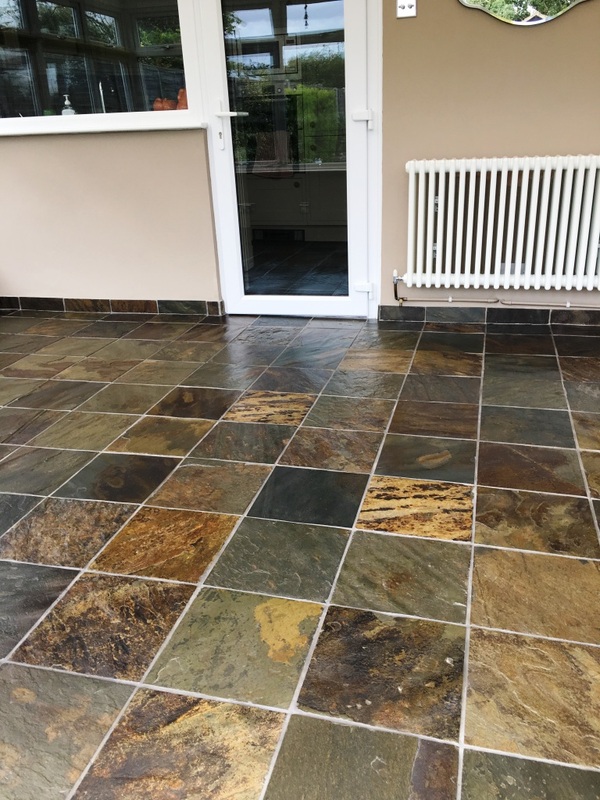 This entry was posted in Slate Tile Posts and tagged Conservatory, Eastbourne Tile Cleaning, Eastbourne Tile Restoration, Eastbourne Tile Sealing, slate tile cleaning, slate tile restoration, Slate Tile Sealing by AbzDominise. Bookmark the permalink.